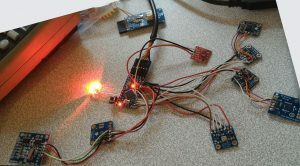 During this summercamp i was working on a patch with 5 sensors, a memory chip and a timer chip. 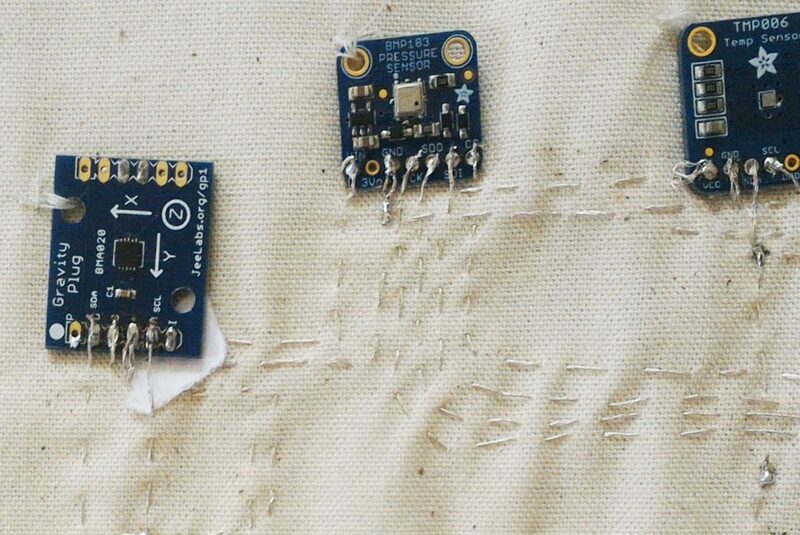 For “me” patches are small pieces of fabric with a circuit on it. Patches are close to the e-swatches. Trying out some kites at Paillard. The first version for testing was with normal electrical wires. It is the “slow” measuring circuit, because the FRAM memory is only 32K. For tracking of movement i have another circuit with an SD card. The real movement of the kite should be reconstructable from the acceleration and the time using integration (Euler or Verlet method). An acceleration sensor doesn’t give position, but using acceleration, time and the boundary value of zero speed, you can calculate the position. FRAM in the circuit because direct Bluetooth transfer of data is too slow. The data measured are pollution, temperature, humidity, air pressure, light, UV. 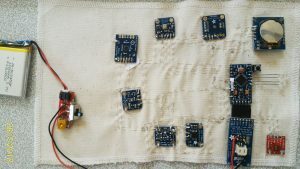 Four I2C sensors and one SPI. The acceleration, FRAM an the RTC also I2C. 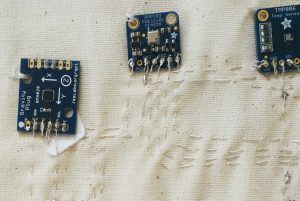 The I2C sensors can be chained. Getting the data reasonably into the FRAM memory of chars was the usual conversion problem – FRAM memory is char, while the values from the sensors can be anything, integers, doubles, floats. Reading back using an adafruit Bluetooth EZ-link and making sense of it in a simple Processing sketch, later to be refined – that is make it into a datavis. The patch being tested the circuit was sewn on a fabric. The normal wires replaced by Grimm silver wire. There were a few shortcuts which i solved measuring the small residual resistance of the silver wire, at different points and deducing from the value where the silver thread was touching. Where the resistance value is the lowest is the closest to the mistake, sometimes just one of the small silver threads of the wire being caught in the stitch of the other wire. Then the circuit worked again, but the Grimm wire seems to be a bit unstable. 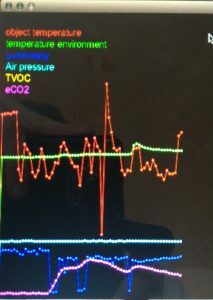 A bit of movement and the I2C communication is apparently interfered with, resulting in upsetting the data. So for the rather violent movement of the kite, the Grimm wire is not suited. I think i have to go back to the normal wires I had.